Solar Power for Ordinary People | Solar Energy is ideal for a country like India which has plenty of sunshine with well over 300 average annual sunny days. If an electrical appliance consumes 1000 watts for one hour, it has consumed 1 kWh of energy or 1 unit of electricity. So, 1000 watt hours = 1 kilowatt hour (kWh). If you run a 100 watt bulb for 10 hours, it again consumes 1 kWh. Solar panels are characterized by number of watts (Wp) they can produce under Standard Test Conditions (STC) of 1000 W/m2 irradiation, cell temperature of 25 degree Celsius and air mass of 1.5. This is their peak performance. However, the amount of power they actually produce in outdoor conditions depends upon the amount of sunshine. Air mass is a measure of the distance traveled by sunlight through the Earth’s atmosphere. Since light intensity is attenuated by scattering and absorption, the more distance it passes through the atmosphere, the greater is the attenuation. Consequently, the sun appears less bright at the horizon (morning and late afternoon) than when at the zenith (noon). An air mass of 1 means the sun is looking straight down on the sea surface when it is directly overhead. At any location with latitude greater than 23.5 degrees, the sun is never directly overhead and so air mass will be always greater than 1. The number 1.5 has been agreed upon for the STC (Standard Test Condition) for testing solar panels. Solar irradiance is the amount of sunshine incident on a unit area and is typically expressed in watts per square meter (W/m2) or kilowatts per square meter (kW/m2). Irradiance is measured through an instrument called ‘pyranometer,’ which displays the instantaneous power available from the Sun. Solar constant is the solar irradiance outside the earth’s atmosphere on a 1 square meter surface oriented normal to the sun’s rays. It is about 1367 W/m2. This is attenuated by the atmosphere and the peak solar insolation on a earth’s surface oriented normal to the sun on a clear day is of the order of 1000 W/m2. Insolation is the amount of solar irradiance that is incident on a fixed area over a period of time, and hence is a unit of energy. It is typically expressed in watt-hours per square meter per day (Wh/m2/day) or kilowatt-hours per square meter per day (kWh/m2/day) or even (kWh/m2/year) for a particular location, orientation and tilt of a surface. Since 1000 W/m2 is “1 sun”, one hour of this ideal irradiance produces 1,000 watt-hours per square meter (1 kWh/m2). This is also known as “1 sun hour.” Colorful maps of solar potential display solar energy in kWh/m2/day, which is equivalent to the number of full sun hours per day. This is a useful parameter for sizing solar panels in the PV systems. More “sun hours” means more potential for solar power. Global Horizontal Insolation (GHI): It is the solar insolation received by a fixed flat horizontal surface. Global Tilt Insolation (GTI): The fixed solar panel or collector is generally inclined at an angle roughly equal to the latitude of its location (facing south in India or any place in the northern hemisphere) to maximize the annual insolation received. The insolation received by such an oriented surface is called the Global Tilt Insolation (GTI). How much energy does one panel produces? The unit of electrical energy consumed is generally measured in kilowatt-hours (kWh). If an array of solar panels rated at 1000 Wp produce electricity for 1 hour under good sunshine, they have produced 1 kWh or 1 unit of electricity. The total amount of energy they produce during the day is governed by things like solar latitude which is associated with latitude and season, and atmospheric conditions such as cloud coverage, temperature and degree of pollution apart from panel orientation and shading. For same sunshine, panels produce more power in cooler climates than under hot temperatures. In India, ideal orientation for solar panels is slight tilt towards true south; in South India placing panels flat (horizontal) will also do. How much space is required to install 1 kW solar panels? Under clear skies and good sunshine each square meter is receiving about 1000 watts of solar energy. At typical 15% panel efficiency, a 1 sq m area will generate 150 watts of power. For 1 kW power output about 7 sq m area will be required. After leaving some free space, about 10-12 sq m clear roof area will be required. How much power a 1 kW solar PV system will annually produce in Delhi? New Delhi has average daily sunshine of 5.5 hours. If we assume loss of 30 days due to rains and clouds every year, then total annual sun hours are 5.5 x 335 = 1843. Ideally 1843 kWh of energy can be produced. But the actual performance will be less than 100 percent because the outdoor conditions are different from standard test conditions of the panels. So, for a 80 percent system performance the annual power production will be 1474 kWh (ie 1843*0.8). In locations where there are shadows and panel tilt is not towards true south, it is often advisable to consider loss of another 10-15%. Why can’t we phase out fossil economy in next 20 years? Year 2014 has been the hottest year recorded in human history and 2015 is going to be hotter! And it is only 0.85 degree warming over the pre-industrialization era!! Around 40,000 brains from 195 countries will gather in November end in Paris for a meeting that they hope will relieve the world of global warming and climate change worries. The aim of the conference is to arrive at agreements that commit nations to massive emission cuts so that temperature of the globe doesn’t rise more than 2 degrees by 2100, above the pre-industrial era 2 centuries ago. Ahead of the conference, 146 countries have made pledges to cut their emissions (in the UN language it is called Intended Nationally Determined Contributions (INDC)) from 2020. Even if these pledges are honestly implemented (which most people doubt), experts calculate 2.7 degree Celsius rise by 2100. So the vital goal of Paris meeting will be to have countries agree to much deeper emission cuts and arrive at some mechanism to bind them to their pledges. Of course, the ideal solution is to shift entirely from fossil fuel economy to renewable energies which is again a matter of political will and countering vested interests of companies in burning fossil. Are developed nations helpless to contain global warming? Scientists and experts have been warning that if the greenhouse gas emissions continue to rise at the current pace and the planet warms beyond 2 ˚C by century end, above the pre-industrial levels, earth’s climatic conditions would get catastrophic and irreversible. Under the current business-as-usual emissions trajectories planet’s temperature is heading for well above 2 degree, to about 5 ˚C rise. It must be nightmare for those walking on the earth at that time. The World Bank’s 2013 report, Turn Down the Heat and Price Waterhouse Coopers speculate 4 degree rise by the end of the century if the business-as-usual scenario continues, but International Energy Agency (IEA) sees the world heading for a 6 degree rise if we do nothing. According to Professor James Hansen even a 2 ˚C rise will cause “major dislocations and extremely hostile climate for human life”. What is at stake is the human civilisation; therefore, global warming or climate change should not be reduced to the level of trivial coffee shop topic. In fact, low lying and vulnerable island countries would want global temperature rise to be restricted to 1.5 ˚C. But the so-called developed world is not comfortable with that and rejected the idea in 2009 in Copenhagen itself. Scientists have calculated that in order to stay below 2DS only 565 more gigatons of carbon dioxide can be emitted by 2050. But oil companies are sitting on five times more reserves. 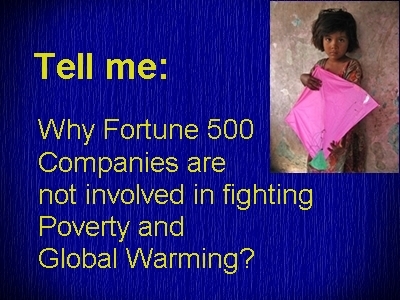 Should not the rich corporations become part of climate solution? Developing countries have always maintained that for the atmospheric CO2 problem, the fault squarely lies with the industrialized nations who became rich before other nations could catch on by burning fossil fuels to power their industrial development. Therefore, prime responsibility for drastic emission cuts lies with developed nations. Moreover, they argue that providing post-2020 finance to developing countries is based on the historic responsibility of the so-called ‘developed’ nations. In India’s viewpoint this is ‘fundamental’ to the success of Paris Summit and it has to be ‘predictable’. and scaled up from $100 billion upwards. Of course, the so-called ‘developed’ nations want to evade contributing to the Green Fund and want to rope in other players such as – the emerging economies, the World Bank and the private sector. An analysis of 20 countries that are responsible for 81% global emission doesn’t inspire much hope. China, the largest emitter with 24% emission share, plans to double its CO2 emission – it will be adding 363 additional coal-fired power plants. The second largest emitter, US, is likely to do what it has done in the past. President Obama may agree to whatever emission cuts at Paris, but there is no chance of Congress approving it, just as it vetoed the Kyoto Protocol of 1997. 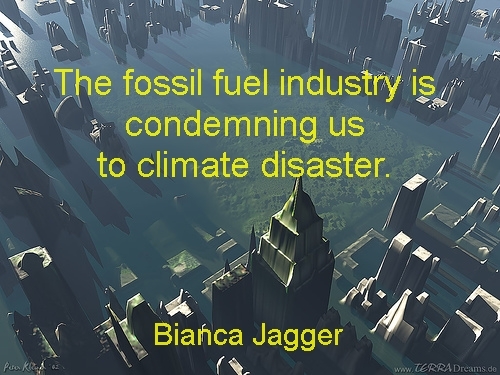 It is still controlled by the fossil fuel lobby. The third largest emitter India plans to treble its emission by 2030 despite mega plans to embrace solar power and energy efficiency. The next largest emitter Russia plans to expand its industrial base by 38%. Next in line, Japan, will be building more coal-fired power plants and South Korea is also doing nothing much. Saudi Arabia and Iran appear unconcerned about global emission cut concerns. The UAE is also happily increasing its emissions, except to say that it will invest more in solar and nuclear power. Brazil’s only concern appears to slowing down felling and burning of Amazon raiforest. The EU is the only part of the world pledging to cut emissions by 40% by 2030. But even there, Poland and Germany plans to add more fossil powered power plants. 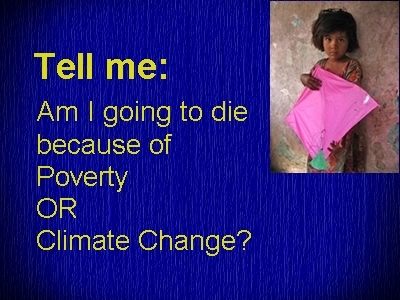 What about the Green Climate Fund for the benefit of developing countries? It was earlier agreed that by 2020 it will get $100 billion each year? So far, pledges add up to only $700 million. The United States, sole superpower in the world, has failed to show any sense of responsibility and leadership quality to justify its superpower status. It chickened away from signing the earlier Kyoto Protocol of 1997. It is a country that is run for the rich, by the rich who have considerable stake in continuing fossil fuel economy. The US seems to be a weird country: it can put together a global alliance to fight its so-called ‘war on terror’ and pump several trillion dollars. But it fails miserably when it comes to fighting poverty or climate change. Clearly, it finds fighting wars and invading countries more profitable for its companies. Imagine the profits its arms and oil industries made from its long-drawn Middle East military adventure. Wars offer solid boost to GDP, as is common knowledge. In the current scenario, there is no way to make the US mend its ways. The only thing that might possibly force it to show any environmental leadership is a scenario where the country is hit really hard by a series of natural disasters that cause widespread losses and shake the rich elites – just as 9/11 terror attack shook it to gear up for ‘war on terror’ in 2001. However, increasing penetration of internet around the world now ensures that ordinary people of the world have access to information from non-media non-journalist sources. So they now have some say in what was so far in the privileged domain of politicians, governments and powerful global vested interests. Corporate media continues to work for their corporate bosses, but fortunately it no longer has absolute monopoly of dissemination of information and shaping public opinion. Increasingly, people around the world are discovering the power of electronic social media – websites like facebook, twitter and other online channels now connect people with information instantly. As this cyber community continues to grow stronger, its power to shape public opinion and change government policies is also growing. Now any news on climate change gets instantly transmitted across the world, without editing, twisting or filtering by the so-called ‘experts’ and journalists. 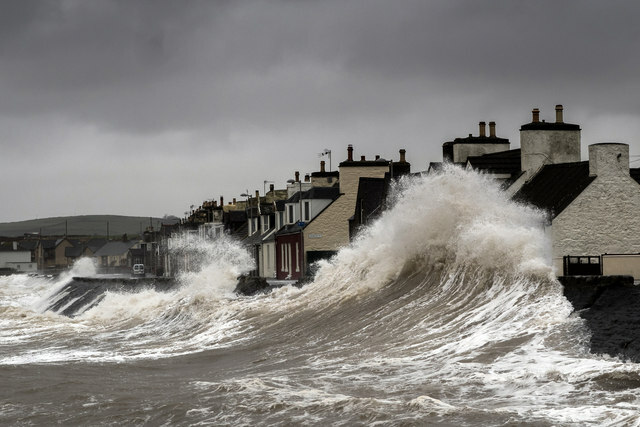 As a result, it appears that more and more stakeholders are getting eager to become part of climatic solution – even the die-hard climate change deniers are switching sides once exposed to harsher climatic events and scientific data. Their side is increasingly losing ground in the traditional tug of war with the pro-action humanity. Low carbon world is no longer as threatening to them as technological progress in the non-fossil alternatives ensure them to still live within their ‘energy comfort zone’. There is Cause for Optimism Now! In the past, low carbon solutions were not attractive enough for consumers or investors. But then governments stepped in with subsidies on both demand and supply side for renewables. They also tried to price carbon through taxation or cap and trade system. Though the efforts did not change global emission trajectory but ended up creating large enough low carbon markets that reduced costs of alternate technologies. It is encouraging both consumers and investors that would further expand the markets and further reducing prices – a virtuous cycle by all means. This is the cause of optimism and hence the paradigm shift. Therefore, even if the Paris Summit fails to produce any tangible and meaningful result and global leadership fails this year, they will be facing much ferocious pressure next year, and year after that, till they do what global citizens want. Now is perhaps the best time to accelerate the pace of global energy transition and phase out fossil economy, forever. As the so-called ‘Climate Change’ is worsening month by month and abrupt/extreme weather events are becoming more frequent everywhere, more and more people are feeling the need to get away from the usual fossil fuel (coal, oil, gas) generated electric power supply. In many states there is perennial shortage of power and in many areas the problem is really acute. So people are exploring ways to install solar PV system for their home, office or industrial premises. The ministry of New and Renewable Energy (MNRE) promotes off-grid solar PV systems up to 100 kW under the Jawaharlal Nehru Solar Mission by offering 30% subsidy on capital expenditure for both residential and commercial entities. It also provides loans at 5% annual interest for 5 years. Commercial establishments have the choice to claim either capital or interest subsidies. In India, sunshine is the most abundant natural asset throughout the country – but as with other things this has also remained largely un-harnessed so far. Depending on the location, the daily incidence ranges from 4 to 7 kWh/m2, with sunshine hours ranging from 2300 to 3200 a year. About 58% of country’s total land area (of 1.89 million km2) receives annual average Global insolation above 5 kWh/m2/day. So the future wellbeing of India lies squarely with the solar power. Therefore, current situation demands that embracing solar power must become a national culture – it has begun to happen already as the prices of solar panels per watt keep falling. Incremental technological improvements have ensured that panels per sq foot progressively convert more sunlight into energy. Put together technological improvements, falling prices, expanding solar market and government incentives are motivating more and more people to ‘go solar’. However, before ‘going solar’ there are some important considerations about solar PV systems that must be kept in mind. Since your solar PV system will incur capital expenditure, it is important that you size it accurately. It starts by estimating your current electricity consumption. Since the daily electricity consumption will decide the size (hence, cost) of your solar system, it is prudent to first go for energy efficient appliances so that your energy requirement is minimized. Therefore, energy efficiency considerations should precede design and installation of the solar system. The first step towards energy efficiency involves reducing power consumption by replacing all CFL/tubelights with LED lights and existing fans with energy efficient fan. (You may like to explore Advantages and drawbacks of LEDs and Super efficient and other fans and here is a 25W fan! ) It will incur some additional cost but take it as a long term investment that will pay off itself in next couple of years through savings in the electricity bill. Consider energy efficiency in all your future purchases of electrical appliances. High wattage appliances such as ACs, desert coolers, water heaters and water pump etc should not be operated through your proposed solar system in order to keep its size and cost low, though solar ACs and cooler’s are also now available in the market). The insolation map shown here gives solar insolation across the country. In India, most locations receive 4-7 kWh / m2 / day. You can get an approximate idea about solar insolation at your location from this NASA website by entering your latitude and longitude numbers. If on a particular day insolation is 6 kWh per sq meter, a 1 kW solar PV system would produce 6 kWh of energy. Obviously, more sunlight means more electricity from your solar PV system. But there are other factors that affect the system output. Efficiency (wattage per unit panel area) of the panels becomes an important issue where rooftop space is limited. Lower efficiency panels occupy greater area than higher efficiency panels, so you can place only a limited number of panels on the available area. It will limit the size of your solar PV plant. If you have limited rooftop space, choose solar panels with maximum wattage per sq foot. Typically, a 1 kW solar PV system requires around 100 sq feet area depending upon the panel efficiency. Efficiency of a panel is given as panel kilo-watt (kWp) per sq meter area of the panel, expressed as percentage. Consider 200 Wp and 250 Wp solar panels, both with area 1.61 sq meter. Their efficiencies will be 12.42% and 15.5%. Obviously, using 250 Wp panels would require less rooftop space. Using the 1.61 sq m area of the above two panels, you will require 1.61 X 5 (or 9 sq m) space if you use 200 Wp panel and 1.61 X 4 (or 6.4 sq m) with 250 Wp panels. Approximating 1 sq m with 3.3 ft x 3.3 ft (about 11 sq feet) you need 70 – 100 sq feet rooftop space for your solar PV plant. Note that cheaper panels come with lower efficiencies – they will require larger rooftop space. But 100 sq feet is a good number – easy to remember as space required for a 1 kW plant. Panel cost: Solar panel’s cost vary between Rs 30 – Rs 60 per watt. Indian make panels are available in the price range Rs 30-35. Imported modules cost around Rs 40-45. It is somewhat counter intuitive but solar panels generate less power as they heat up in hot summer days. So temperature of the panel affects its output. In fact, it is not surprising to find the best output in the winter months when panels remain cooler. Therefore, solar panels have negative temperature coefficient – for example, -0.45. It means every 1 degree rise in temperature will reduce power output by 0.45%. Likewise, a 1 degree decrease in temperature will increase panel output by 0.45%. Thus, a 250 Wp panel (usually rated at 25 ˚C) will behave like a 256 Wp at 20 ˚C and even higher in the cold winter and as 228 Wp panel at 45 ˚C in hot summer. In fact, the ‘cold desert’ Laddakh in J&K is the best place for solar PV plants because the temperatures are very low and sky generally clear. Of course, if you are located in say, Chennai or Delhi this information has no meaning for you. But it helps to know that ideal locations would have low temperatures and higher insolations. Although you have no control on ambient temperature at your location, but can plan to position the solar panels to allow higher air circulation rather than at enclosed locations. Even if you have a large roof your solar PV power plant needs shade-free area. Shadows may come from neighboring structures like other buildings, mobile phone towers, hoardings, trees. It may even come from the PV plant itself – a row of panels may cast shadow on the rows behind it. Note that at higher latitudes shadows are longer and large roof space is required for the plant. However, in India it is a minor issue. Shadows not only reduce the panel output, they may also cause panel damage. Shadowed areas turn from being conductor to insulator and start heating up – it can eventually burn up those areas. Such damages are not covered by warranty. India lies in the northern hemisphere with its southern tip quite close to equator. In northern hemisphere you would ideally like to mount the panels on a south facing roof because if you are in the temperate zone the sun is always towards south and if in the tropical zone the sun is predominantly in the south. If there is problem with southern side, you may also mount panel facing 45 degree east or west of south. Tilt or angle with respect to horizontal is another important parameter. For fixed panel system it is typically taken as the same as the latitude of your location. In case of confusion, the best option is to consult a solar PV system installer. Actual power output of your solar PV plant is a complex thing that depends upon so many variables – insolation, panel orientation, tilt angle, temperature and so on. But in India, we have some indicative data for guidance. A 1 kW PV plant generates about 1600 – 1700 kWh (units) per year which is about 4-5 kWh (4000 – 5000 Wh) per day. This is also about the daily power consumption of a small family. Therefore, a 1 kW solar PV plant can serve most households. Conventionally, PV plant’s performance is given as capacity utilization factor (CUF). CUF is the ratio (expressed as percentage) of the actual output of a plant to the maximum possible output under ideal condition (assuming that the sun shone every day of the year). The CUF for many solar friendly Indian states is in the range 18-20 ­[for example, Gujarat (18), Andhra Pradesh (20), Uttarakhand (19)] and the average output of 1 kW plant in these states lies in the range 4.3 – 4.8 kWh. Thus, a 1kW plant in Andhra (CUF 20) is expected to generate 4.8 kWh (or 4800 Wh) per day. This is an important factor in windy areas because solar panels along with their mountings can be fairly heavy. It is not a problem for concrete roofs but asbestos and other roofs may be too fragile and pose safety problems. So the roof should be sturdy enough to withstand the weight and wind load of the plant. In recent years, cyclones such as Aila and Phailin with wind speeds of 120 – 200 kph have knocked down thousands of solar systems. In coastal areas prone to such calamities, this issue should be particularly discussed with the installer. Consider this data sheet for 125Wp and 150Wp off grid solar panels from EMMVEE. Module weights are 12Kg and 16Kg. If you use 7 150Wp modules for a 1 KW solar PV rooftop system, weight of the panels alone would be 112Kg – you may add roughly an equal weight of the mountings. So 200 – 250 Kg for the whole system on your roof. You will need to store the DC current from the panels into batteries and then convert it into AC through an inverter for end use. Remember that the type of batteries and inverter will also determine the overall efficiency of your solar PV system. ‘Deep cycle’ lead acid batteries are best suited for your solar application. They generally last for 5-10 years and are about 80% efficient. They are designed to repeatedly discharge 80% of their rated capacity. Note that automotive batteries are shallow cycle and are not suitable. Tubular positive plate or sealed maintenance free (SMF) batteries are best suited for solar PV systems. Size the batteries so that they can store enough power for your needs during cloudy or rainy 2-3 days. A pure sine wave inverter is the ideal choice for all kinds of appliances but is always costlier. Modified sine wave inverters are relatively cheaper, less efficient (they waste some power as heat) and create a buzzing sound with appliances. So make a choice between the two types based on your budget and other requirements. In summary, energy efficiency considerations must always precede solar PV design; it further helps to know various factors that dictate the actual power output from your solar system. Disclaimer: This blog has no business interest in products of any company whose website is mentioned here. 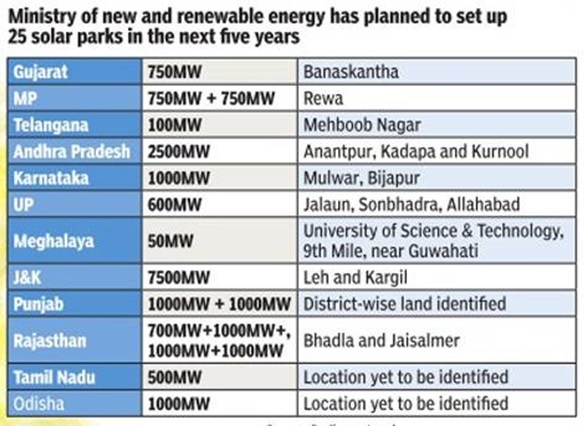 The Union Ministry of New and Renewable Energy (MNRE) has announced a scheme to develop at least 25 solar parks, each with a capacity of 500 MW and above targeting over 20 GW solar power, across the country in next five years at an outlay of Rs 4050 crore. The final scheme from the MNRE can be accessed here. It was approved by the union cabinet in Dec 2014. These solar parks are common development zones for solar power projects and offer developers location that is well characterized, with proper infrastructure and access to amenities and where the risk of the projects can be minimized. Solar Park also facilitates developers by reducing the number of required approvals. Charanka Solar Park in Gujarat is the first-of-its-kind large scale solar park in India with contiguous developed land, transmission connectivity and provision of other amenities and infrastructure. A solar power developer can get fully developed land along with transmission and other facilities and can, therefore, set up a power project immediately. The Charanka Solar Park has a capacity of 590 MW, out of which 224 MW has already been commissioned by 20 developers. Utilizing economies of scale, the Ultra Mega Solar Power Projects (UMSPP) with capacity of 500 MW or above have also been planned. Large chunks of land are available in some States for solar park development. There are some developers who are keen to individually take up such huge solar power projects. Some UMSPP may be set up in the proposed Solar Parks or the entire park may individually be an UMSPP. Smaller parks could also be considered under the scheme in Himalayan states where large tracts of contiguous land may be difficult to acquire and in States where there is acute shortage of non-agricultural lands. The solar parks would be developed in collaboration with state governments and so far 12 states have shown interest. Lands have been identified in Gujarat, Madhya Pradesh, Telangana, Andhra Pradesh, Karnataka, Uttar Pradesh, Meghalaya, J&K (Leh and Kargil), Punjab and Rajasthan. Solar Energy Corporation of India (SECI) under the ministry would be the nodal agency and manage the funding for a fee, equivalent to 1% of the grant disbursed. The State Governments will play an additional role in the development and operation of the solar parks. They would be free to choose their agency for implementing, developing and maintaining the solar parks. Special purpose vehicles (SPV) of state governments too would be eligible to develop and manage the parks, as would be 50:50 joint ventures between SECI and state government entities. The money is expected to be spent in phases, starting with Rs 500 crore in 2014-15 and going up to Rs 1,400 crore in 2018-19. In Madhya Pradesh, a special purpose vehicle (SPV) has been formed between the Center and the State. The power evacuated would be sold to the SECI which would then sell it to the utilities. Telangana is also likely to sell solar power to the SECI. The project developers would bid for viability gap funding support from the Centre. They would be selected through bidding as per norms set by the central tariff regulator. The solar parks offer facilities to make them attractive for investors/developers. Individual promoters usually have to spend a lot of time to acquire land, get change of land use and other clearances from various state government bodies, including consent from state transmission utilities which cause delays. They also have to incur significant expenses in site development, drawing separate transmission lines to nearest substation, procuring water and in creation of other necessary infrastructure like fencing, waste treatment and so on. A solar park removes most of the hurdles faced by individual small project developers. Under the scheme, developers would be invited only after all statutory approvals are in place. A solar park offers specialized services to attract investment from private developers. This would include levelled land, roads, water, security, and communication facilities required for commissioning and operating the plants. Centralized Weather Monitoring Stations would be set-up by the implementing agency so as to provide weather data to the projects in the solar parks. Providing these services in a central “one-stop-shop” format will make it easier to implement projects in a significantly shorter period of time, as compared to obtaining these services individually. It should also make it easier to secure financing. Holistic planning of the common infrastructure will also reduce damages to the landscape of the area. These benefits of course come at a price. The estimated cost for development of a solar park would be around Rs 0.95 crore per MW. But they will greatly help in reducing the risk and gestation period of the projects, as developers will not have to waste resources and time for getting statutory and other clearances. At least 20% power will be bought by the state utilities and for the rest project developers will have to sign PPA with other consumers. Therefore, solar park can be thought of as a shopping mall where the mall owners provide the entire necessary infrastructure (at an additional cost) and the shops only need to sell without worrying about parking, security, housekeeping etc. There are people who are not in favour of the concept of centralized solar power generation. Since distributed generation is a key attribute of solar energy they advocate in-situ power generation and consumption in the form of distributed generation such as rooftop solar PV, off-grid PV or solar micro grids. In fact, this is how rest of the world sees solar energy and focus on distributed solar power generation. So they wonder, why is India going in the opposite direction? India has 25 – 30% transmission losses, among the highest in the world, so how does it make sense to have these sorts of centralized huge projects? There are practical reasons that make distributed generation currently unpopular. In fact, the challenges are related to net metering and low residential tariffs. In a country like India where power deficit is so high, both massive solar parks, and smaller stand alone PV systems can easily co-exist if the right incentives are provided. The per MW capital cost of thermal power plants in the range of Rs 4-5 crore. They are still the cheapest among the energy sources, and will probably remain so for quite some time. Although Indian coal is of inferior quality but the country has enough coal for a century. Although the government has reportedly sanctioned at least 200,000 mw of thermal power capacity (translating into a capital investment of about Rs 10 lakh crore over a decade or more) the headwinds against coal is likely to get stronger in the future. Already the environmental argument is getting stronger against it. There is a possibility that in couple of years the thermal power plants become unviable due to a combination of social, economic and environmental reasons. China has agreed to a cap its emissions by 2030, it means pressure will build on India to cap and then reduce its own emissions too. Coal mining will continue to be adversely affected due to agitations from people around the mines, and the employees’ unions’ of Coal India. It means coal production will remain under pressure, necessitating import of costly coal. Thus, coal prices are unlikely to fall. 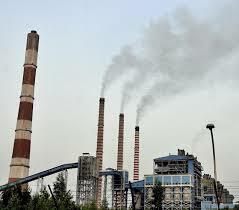 Like in China, the health concerns are set to rise in India as more and more thermal power plants go on stream; thus, inviting judicial verdicts and tighter regulations. Water shortage is expected to increase in the coming years; thermal power plants will also feel the pinch as much as any other business. The International Water Management Institute estimates that by 2030 India can supply only half its water needs. How much will thermal plants get? Coal plants need continuous supply of fresh water, which might be difficult to maintain in a warming and drying world. Water shortage has already shut down thermal power plants. In 2014, the Parli power plant in Maharashtra was shut down due to water shortage. The International Energy Agency estimated that a 35% increase in energy consumption by 2035 will increase water consumption by 85%. Solar power becoming cheaper than the thermal power. This last mentioned force has emerged lately. It will join hands with the other factors working against thermal power. The price of solar power has been falling relentlessly, and the decline is expected to continue over the decade. Ten years ago, solar power modules used to cost $10 a watt. Now it costs 50 cents a watt. In India, solar power prices have fallen by 60% over the past three years; solar power is expected to reach grid parity by 2017, although grid parity is the wrong yardstick to judge solar power. Solar is already competitive with imported coal. Another argument is that unlike thermal power plants, where cost escalates on a yearly basis, the cost of a solar power plant is fixed for the next 25 years of operation. It is not difficult to imagine the likely future scenario. As coal prices increase or remain stable at best, solar panel prices continue to fall though the decline is slower now. Research with much cheaper pervoskite based solar panels points to potential for still further reduction in panel prices. Thus, solar power is likely to become as cheap as coal power within three-four years and substantially cheaper in about a decade. So the game would have been over for thermal power within a decade. However, a crucial shortcoming of solar power provides lifeline to thermal energy. Solar power is produced only during the day time but India’s peak demand comes when the sun begins to go down. Thus, the country would need another source to provide power during peak demand. For this, coal is still the best option. Solar Power is a Clear Winner! Solar power is clear winner in the future. Compared to thermal power plants which take much longer to build and start solar plants can be set up and commissioned in about six months. It means that with right policies India can create capacities of 5-10 GW easily in a year. Therefore, government’s ambitious plan of creating 100 GW solar capacity by 2022 looks quite achievable provided the policies are streamlined and financial and land availability hurdles are removed. India has already been creating roughly 1 GW annually in the past three years. Government is planning to shift the peak demand to the day from dusk through ‘time-of-use rates’ when utilities charge more during peak period, thereby forcing consumers to use less energy during that period. Already, country’s peak demand is shifting towards the day as more buildings with air conditioning are coming up. Karnataka, Tamil Nadu and Andhra Pradesh have taken lead in introducing net metering recently. Other states will soon follow them. 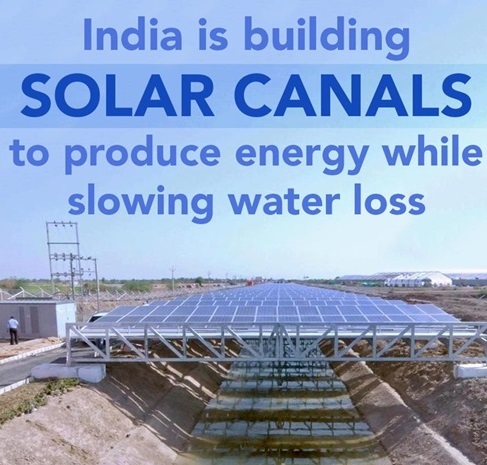 It will give a powerful boost to solar power. Likewise, battery technology is expected to improve in the coming years which will also push solar forward. A booming solar industry would make it difficult to further expand coal capacities in future. Looking at this future scenario some European countries are gearing to switch to renewable energy. But there is a difference between Europe and India: Demand is not growing in Europe while it is exploding in India. Yet, a 100 GW solar capacity would form just 10% of India’s total capacity, therefore solar will not exactly replace coal in the next decade or two. Coal prices will continue to fluctuate and likely increase. In any case, they cannot fall beyond the point where extraction from mines becomes uneconomical. Meanwhile, as climate change scenario worsens, the coal production could invite high and higher tax and other forms of disincentives to push the coal prices up. On the other hand, solar prices are expected to continue the downward journey for many years. Finally, coal and nuclear projects have a history of delays in India. It points to an important fact. India’s strength is not large projects so it may not be able to execute huge power projects the way China has done. Its strength is entrepreneurship. Here solar power fits ideally. Do objects have colors of their own? If yes, then why even the most brightly colored objects lose color when taken to darkness? Following this line of thinking photographer Paul Outerbridge (1896 -1958) concluded that for their color objects depend on light. And that color must be the property of light. In any case, we all know that how good a photograph looks depends upon the quality of light. Color rendering is related to how objects appear under a given illumination. It is one of the most important characteristics of the light sources. If color rendering is poor, the light source will not be useful for general lighting. The influence of artificial light source on the appearance of the colored object is expressed by the color rendering index (CRI). It tells us how truthfully a light source will make an object appear compared with the natural daylight. The larger the difference in color reproduction, the lower the CRI value of the light source will be. In general, higher CRI values – CRI of 80 and higher – make objects look more natural. Lighting sources at the low end of the index, such as low-pressure sodium lamps (CRI 20-30) tend to wash out colors and are best used in applications, say roads, where accurate color rendering is not important. An incandescent or halogen light bulb, on the other hand, is considered to have a “perfect” CRI of 100. Linear fluorescents and compact fluorescents (CFLs) usually fall in the 80 to 90 range. There are specifications of minimum requirements for both the CRI as well as Lumens per watt for common types of light products. Higher CRIs (CRI of at least 80) are recommended for office applications, still higher for showrooms or where fine designing work is being done. Lower values are permitted for living space, corridors, warehouses and street lighting. Likewise for office atmosphere, minimum 500 lux illumination is recommended for general activities and up to 750 lux for task areas requiring precision work and concentration. The illumination in the immediate surrounding area (band of at least 0.5 m around the task area in the visual field) should be 65 – 75 percent of the task area illumination. The rest of the background area adjacent to the surrounding area should have a minimum one third illumination level as compared with the surrounding area. Note that the ceiling represents a large reflection area and the reflected light creates an impression of homogeneity and most truthfully mimics the natural light. The ceiling illumination can be about 30 percent of the working space illumination value. Incandescent bulbs create light by passing electricity through a metal filament until it becomes so hot that it glows. They release almost 90% of their energy as heat. In a CFL bulb, an electric current is passed through a tube containing gases. This produces ultraviolet light that in turn gets transformed into visible light by the fluorescent coating (called phosphor) on the inside of the tube. A CFL releases about 80% of its energy as heat. In comparison, LED lighting products use light emitting diodes to produce light very efficiently. In LEDs the movement of electrons through a semiconductor material produces light; a small amount of heat is released backwards, into a heat sink. LEDs thus consume much less electricity to get a certain amount of light output. People are normally more familiar with lights such as the incandescent bulbs and CFL lamps, but now more economical LED light sources are available. These are solid state devices that emit light with the passage of current. Wattage: Wattage is connected to the electrical power consumption. The earlier incandescent light bulbs consume too much electricity to produce the desired amount of light. CFL lamps consumed much less electricity for the same amount of light. Now we have LED lights that still consume less electrical power to give you the same amount of light. Lumens: Lumens (lm) represent the actual amount of ambient light coming from a lamp. The higher the amount of lumens, the more “lit up” a room will be. With the arrival of LED lights, lumen is a better way to talk about “lighting power” than the electricity consumed. The human eye is sensitive to only a small portion of the electromagnetic spectrum – 400 – 700 nanometers. Wavelengths outside this range are not useful as far as illumination is concerned. Moreover, the human eye is not equally sensitive to all wavelengths in this range but instead shows maximum sensitivity at around 555 nm. This distribution is in the general form of a bell-shaped curve and is called the spectral luminous efficiency function. So, we are only interested in the intensity of this light or luminous flux (lumens). LEDs produce a good amount of Lumens per watt, much better that incandescent bulbs or CFL lamps. There is another practical aspect of a light source. It needs to be housed and normally shaded in some way to prevent glare, which is an undesirable side effect resulting from direct viewing of the light source. Therefore some light intensity (or lumens) may be lost due to housing. LEDs generally don’t require shading or reflectors, and thus can provide more useful lumens. The huge potential for energy saving is the main driving force for solid-state lighting because they offer the best lumens output per watt. Light sources that are not incandescent radiators have what is referred to as a correlated color temperature (CCT). Color temperature is a way of mentioning the color characteristics of light source – warm (yellowish) or cool (bluish), and measuring it on the absolute or Kelvin temperature scale. Color Temperature is not how hot the lamp is; it the relative whiteness of a piece of tungsten wire heated to that temperature in degrees Kelvin. On the absolute temperature scale, the temperature is expressed in degrees Kelvin. You get temperature in Kelvin if you add 273 to the degree Celsius. Thus, room temperature of 27˚C is 300K. While CRI represents how accurate a light source is, color temperature represents the character of the light source. At the low end, a color temperature of 2600-2700K creates a warm light character like that seen in incandescent bulbs; a higher color temperature of 4100-5500K creates a whiter light like most often seen in office buildings. Color temperature is a way of describing the “color” of the emitted light. The term ‘temperature’ refers to a real temperature of a physics concept known as a ‘black body’. A black body absorbs all light falling on it, but conversely, according to thermodynamics, is also a perfect emitter. Here it refers to the filament which is being heated. At some point it will get hot enough to begin to glow. As it gets hotter its glowing color shifts;first red, then orange, then yellow up through bright white. The temperature of the material corresponding to those colors is termed the color temperature. Light sources that glow this way are called “incandescent radiators.” Their best advantage is that they have a continuous spectrum; they radiate light energy at all wavelengths of their spectrum, therefore rendering all the colors of a scene being lit by them, equally. Only light from sources functioning this way can meet the true definition of color temperature. Other lights, with a correlated color temperature, do not emit a continuous spectrum of radiations at all wavelengths. As a result, they have difficulty rendering certain colors accurately. Their rendering ability is measured on the CRI scale comparing with the incandescent radiators that are assigned a CRI of 100. High Lumens-per-watt value does not necessarily mean that the light quality is also good. The notion of color quality is a subjective measure. A common misunderstanding is that high CRI means that the light source will render all colors well, but this is not always the case since CRI is measured only with respect to a reference source. The reference source is either the blackbody curve (for test source CCT< 5000K) or a CIE Daylight source (for test source CCT> 5000K). Furthermore, the color rendering of sources, at extremely low or high CCT, can be very poor even though the CRI score is nearly 100. CRI is typically used to compare sources of the same type and not dissimilar sources. Further, if you have 2 light sources at 2800K and 6500K and both with CRI 100, you cannot say that both have exactly the same color rendering performance. Thus, CRI should be used only for some indicative purpose. Since the CRI score is directly related to the spectral power distribution of the light source, it is possible to manipulate the spectrum to your advantage and produce a higher CRI value. Fluorescent lamp manufacturers have been known to “adjust” the CRI by shifting the emission band of their lamp spectra. This can shift CRI by several points. However, a difference of 5 points in the CRI value does not make much difference. An LED (Light Emitting Diode) is a form of solid-state lighting that is extremely efficient and long-lasting. While incandescent and fluorescent lights consist of filaments in glass bulbs or bulbs that contain gases, LEDs consist of small capsules or lenses in which tiny chips are placed on heat-conducting material. LEDs measure from 3 to 8 mm long and can be used singly or as part of an array. The small size and low profile of LEDs allow them to be used in spaces that are too small for other light bulbs. In addition, because LEDs give off light in a specific direction, they are more efficient in application than incandescent and fluorescent bulbs, which waste energy by emitting light in all directions. The key strength of LED lighting is reduced power consumption. LED’s are available at Lumen efficiency of 120 Lum / Watt compared to 65-80 Lum / Watt of CFL, 45 Lum /Watt of Mercury vapour and 75 Lum /watt of metal halide or 94 Lm/watt of sodium Vapour. Conventional light-bulbs waste most of their energy as heat. For example, an incandescent bulb gives off 90 percent of its energy as heat, while a compact fluorescent bulb wastes 80 percent as heat. LEDs remain cool. In addition, since they contain no glass components, they are not vulnerable to vibration or breakage like conventional bulbs. LEDs are thus better suited for use in areas like sports facilities and high-crime locations. Because they produce no infrared energy, the beam of light from an LED source is cool. However, LEDs do produce waste heat during its operation. This must be properly removed from the lighting system to maximize fixture performance and to avoid damage to the LEDs. In well-designed LED lighting fixtures, heat removal is accomplished through carefully designed and engineered heat sinks that draw heat away from the LEDs and dissipate it into the air surrounding the fixture housing. Total light output measured as lumen output is an inadequate measure of the suitability of a lighting fixture for a given task. A better measure is delivered light — how much light a fixture delivers to a unit surface area, as measured in lux (lx) or footcandles (fc). It is the delivered light over a surface that provides you visibility: more lumens over a targeted area means better illumination. It implies that we must discount any light lost in the fixture housing (often over 30%), as well as any light lost as a result of lensing, shading, and filtering. Since incandescent and fluorescent lamps emit light in all directions, you must further discount any light emitted in a direction away from the target area. For instance, a standard 60-watt incandescent lamp emits a total of about 800 lumens, but the light is emitted equally in all directions. Therefore, when you’re reading at your office desk, your desk (or the book) does not receive all 800 lumens from your desktop lamp, nor do you need it to. According to the IES, serious reading requires an average of 50 lumens on a one square foot area (say, your book). An under-cabinet LED light can deliver this much illumination on your page while consuming only about 6 watts. LED lighting fixtures are integrated systems in which the light sources (LEDs), the fixture housing, and the primary optics are inseparable. Lumen measurements of LED lighting fixtures, therefore, are performed on the entire system, and already account for light lost to the fixture housing and lensing. Furthermore, since LEDs are inherently directional, they emit almost all of their light output in the desired direction, rather than dispersing it in all directions. For colored lighting, since LEDs natively produce intensely saturated colored light, there is no need to use any gel or filter for producing colored lights. These block a significant percentage of a fixture’s light output (over 90% for certain shades of deep blue). Therefore, LEDs ideally provide intense light source. Therefore, comparing lighting fixtures on the basis of delivered light, LED fixtures generally perform better than the conventional fixtures, while consuming far less energy. The operational life of current white LED lamps is 50,000 – 80,000 burning hours as compared to 750 to 2,000 hours for an incandescent bulb, 5000 – 10000 hrs of CFL and FLT, 18000 hrs of T5 lamp, 5000 hrs of Mercury vapor, 8000 hrs of Metal halide and 8000 hrs HPSV lamp. LED lifetimes are rated differently than conventional lights which are finished when the filament breaks. In comparison, LEDs typically just fade gradually. The life of a LED light is typically defined as the average number of hours until light falls to a certain percentage of initial brightness in lumens. White light sources used for general illumination are commonly considered to be at the end of their useful life when their light output falls below 70% of initial output. For white and colored accent and non-task lighting, the lumen maintenance threshold is often considered to be 50%. Factors that can cause lumen depreciation include drive current and heat generated within the device itself. LED’s are available in wide range of colors designated by the color temperatures ranging from 2700K to 6500K which are dark yellow, mild yellow and ultra white. LED’s are dimmable. Hence any reasonable fluctuations in input voltage will not affect life of LED as it happens with all other lamps. LED’s being no filament lamp shock and vibration does not affect its life as it happens with all other lamps. In the search for energy-efficient lighting, LEDs have proven to be the most efficient light source available. EnergyStar rated LEDs use at least 75 percent less energy than traditional incandescent bulbs and last 25 times longer, according to the U.S. Department of Energy. LEDs even outdo CFL (compact fluorescent lighting) bulbs in efficiency, primarily because they have twice the lifespan of CFLs. In dozens of nations, green initiatives and energy-efficiency directives are hastening the shift from conventional lighting systems to LED lighting systems, which have the lowest energy consumption and environmental impact, the longest useful life, and the lowest total cost of ownership and operation. Suppliers must also take an active role in educating lighting consumers about the specific advantages of LED lighting and how it differs from conventional lighting. LED lighting is a fundamentally new kind of lighting, using new principles, materials, and means of control. When properly used, LED lighting systems have the ability to improve both the quality of the environment and the quality of people’s life. The performance of a PV module will decrease over time. The degradation rate is typically higher in the first year upon initial exposure to light and then stabilizes. Factors affecting the degree of degradation include the quality of materials used in manufacture, the manufacturing process, the quality of assembly and packaging of the cells into the module, as well as maintenance levels employed at the site. Regular maintenance and cleaning regimes may reduce degradation rates but the main impact is specific to the characteristics of the module being used. It is, therefore, important that reputable module manufacturers are chosen and power warranties are carefully reviewed. The extent and nature of degradation varies among module technologies. For crystalline modules, the cells may suffer from irreversible light-induced degradation. This can be caused by the presence of boron, oxygen or other chemicals left behind by the screen printing or etching process of cell production. The initial degradation occurs due to defects that are activated on initial exposure to light. Amorphous silicon cells degrade through a process called the Staebler-Wronski Effect. This degradation can cause reductions of 10-30% in the power output of the module in the first six months of exposure to light. Thereafter, the degradation stabilizes and continues at a much slower rate. Amorphous silicon modules are generally marketed at their stabilized performance levels. Interestingly, Sdegradation in amorphous silicon modules is partially reversible with temperature. In other words, the performance of the modules may tend to recover during the summer months, and drop again in the colder winter months. • Effect of the environment on the surface of the module (say, of pollution). • Discoloration or haze of the encapsulant or glass. • Mechanical stress and humidity on the contacts. PV modules may have a long term power output degradation rate of between 0.3% and 1% per annum. For crystalline modules, a generic degradation rate of 0.5% per annum is often considered applicable. Banks often assume a flat rate of degradation rate of 0.5% per annum. The conversion efficiency is not constant, but depends on the DC power input, the operating voltage, and the weather conditions including ambient temperature and irradiance. The variance in irradiance during a day causes fluctuations in the power output and maximum power point (MPP) of a PV array. As a result, the inverter is continuously subjected to different loads, leading to varying efficiency. The voltage at which inverters reach their maximum efficiency is an important design variable, as it allows system planners to optimize system wiring. Due to the dynamic nature of inverter efficiency, it is better depicted through diagrams than by uniform numeric values. An example depicting the dependency of the inverter efficiency on the inverter load is given in the figure here. 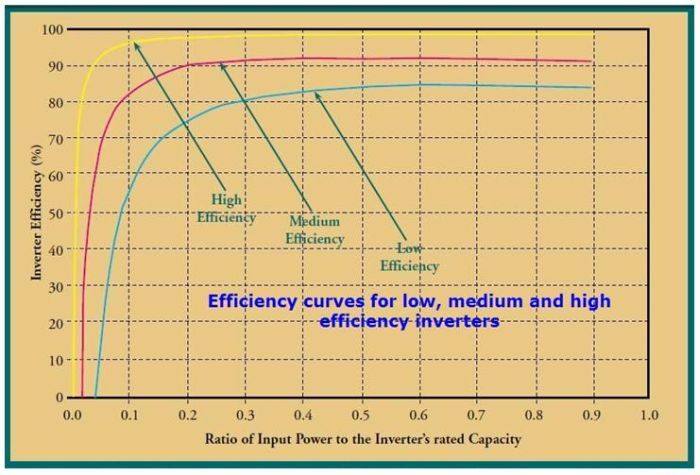 The European Efficiency is an accepted method of measuring inverter efficiency. It is a calculated efficiency averaged over a power distribution corresponding to operating climatic conditions of a central European location. As a useful means of comparing inverter efficiencies, the efficiency standard also attempts to capture the fact that in central Europe most energy is generated near the middle of a PV module’s power range. Another method of comparing efficiencies is using the Californian Efficiency. While the standard is based on the same reasoning as the European efficiency, it is calibrated for locations with higher average irradiance. Inverters can have a typical European Efficiency of 95% and peak efficiencies of up to 98%. Most inverters employ MPPT algorithms to adjust the load impedance and maximize the power from the PV array. The highest efficiencies are reached by transformer-less inverters. The inverter market is dominated by SMA Solar Technology AG, which has a higher market share than the combined share of the next four largest vendors (Power-One, Kaco, Fronius, and Siemens). Other inverter manufacturers hold the remaining 18% share of the global market. Over the past year, a number of major industry players have started to enter the inverter market. These include GE, ABB, and Schneider Electric (through the acquisition of Xantrex). In 2010, the growth in the solar PV market and delays in production (due to scarcity of key electronic components) led to a global shortage of inverters. The performance of a PV power plant is expected to fall during its lifetime, especially in the second and third decade of its life as modules continue to degrade and plant components age. In addition to the quality of the initial installation, a high degree of responsibility for the performance of a PV plant lies with the O&M contractor. The capacity factor of a fixed tilt PV plant in southern Spain will typically be in the region of 16%. This means that a 5 MWp plant will generate the equivalent energy of a continuously operating 0.8 MW plant. Plants in India operating within a reliable grid network are expected to have a similar capacity factor.